हम Adda247, पर Competition Power Magazine eBook का सितम्बर 2018 का संस्करण लाए है जो बैंकिंग, एसएससी, बीमा, रेलवे और अन्य सभी प्रतिस्पर्धी परीक्षाओं के लिए अध्ययन हेतु एक पूर्ण समाधान है. एक अच्छी पत्रिका से न केवल आपको अध्ययन सामग्री, युक्तियाँ, संकेत और करेंट अफेयर्स और अन्य विषयों के अध्ययन हेतु आवश्यक ज्ञान सामग्री मिलेगी बल्कि वह आपको अमूल्य अंतर्दृष्टि प्राप्त करने में भी मदद करेंगे जो प्रतिस्पर्धी परीक्षाओं की चुनौती को पार करने में आपकी सहायता कर सकते हैं. 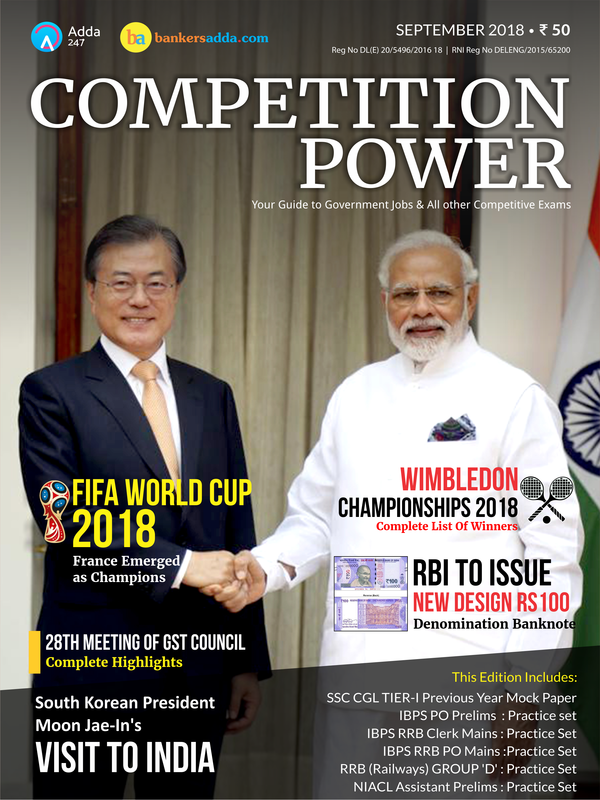 Adda247 brings to you September 2018 Edition of Competition Power Magazine eBook, which is a compact solution to stay updated regarding Banking, SSC, Insurance, Railways and all other competitive examinations. Getting hold of the right magazines will not only give you study material, tips and essential knowledge of current affairs and other topics, they will also help you glean invaluable insights which can help you crack competitive examinations more easily. Dear readers, please note that due to some technical reasons, we are NOT accepting new subscriptions of the hard copy of Competition Power magazine. Those, who have already subscribed, will continuing receiving the same.